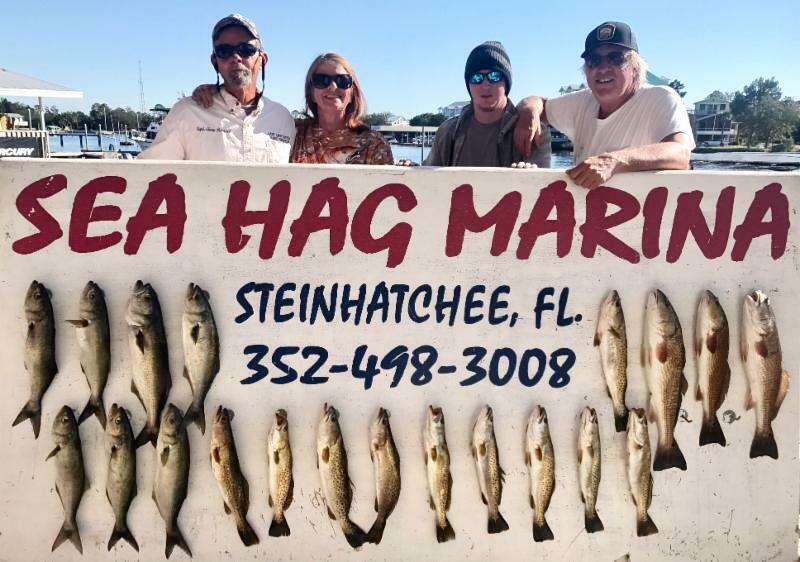 Happy New Year to all….December was a great fishing month at the Sea Hag Marina, in fact one of the best in recent times because the temperatures were moderate for much of the month. Winter-time fishing is notoriously inconsistent, with great days and skunky days at times back-to-back. But wintertime this year, being more mild, provided some great redfish and trout fishing even after the temps dropped during Christmas week. There were still some tough days, even for the guides, but overall it was a great month, as you can see from some of these pictures. 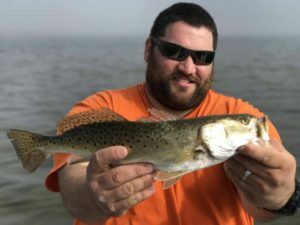 While we never got sustained bitter temps, they are on the way, which will bring fish into the river in large quantities, and I’ll talk about that in the forecast. 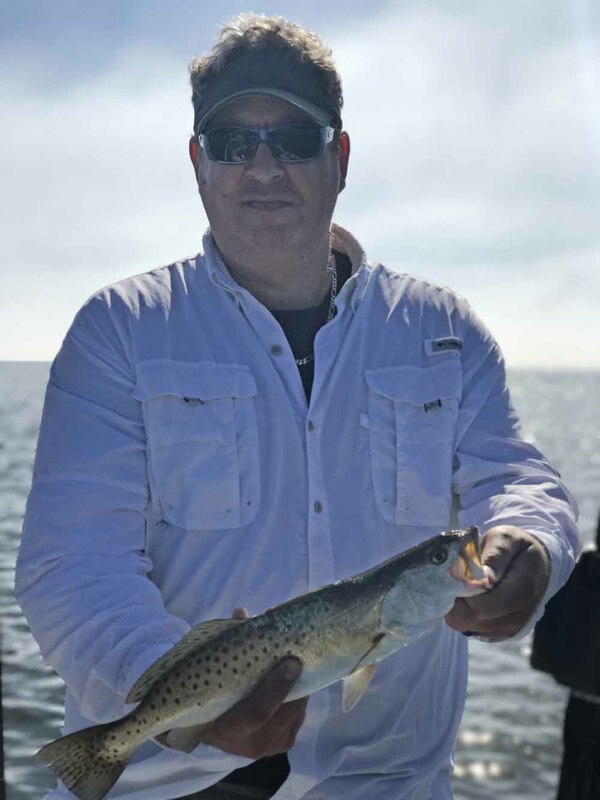 Rob Livingston with a fine upper slot trout. Rob’s son Taylor and his friend Seth with some of the fish we found midway through the month. 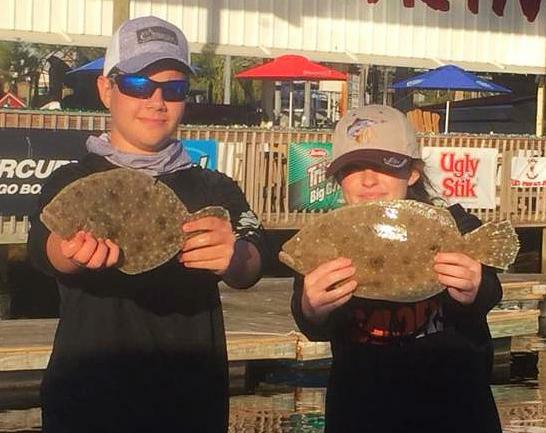 Denna Deese and Garrett Molloy from Gainesville with two keeper flounder. 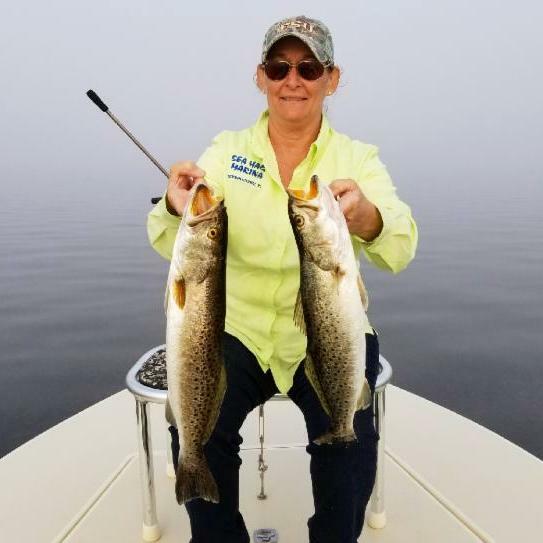 Karen Doucette and her husband came up from Miami to find these nice winter trout. Dawn Taylor from Perry found this upper-slot redfish in a creek. Gary Warren from Gainesville with another large winter trout. 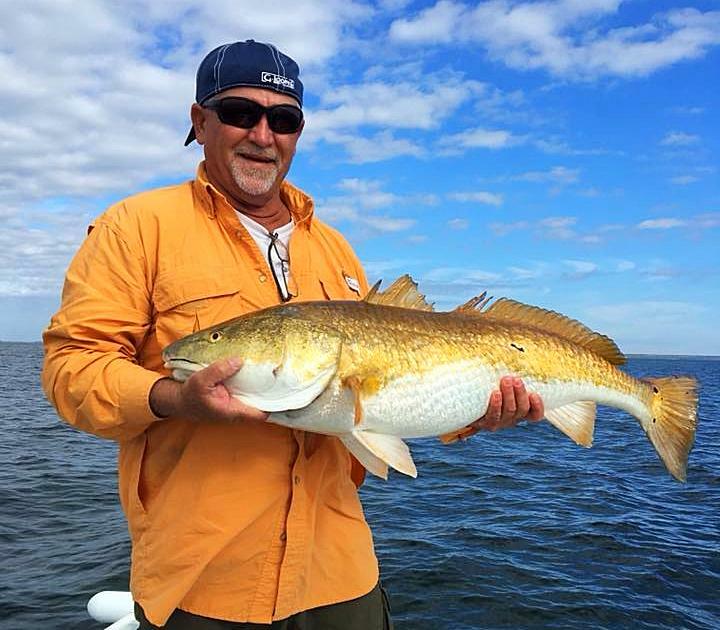 Donnie Raulerson fished Dallus Creek and caught this overslot 39 inch redfish. Fishing the Eggnog Open, Vinny Phu and Vanessa Allen came in with the largest legal redfish. 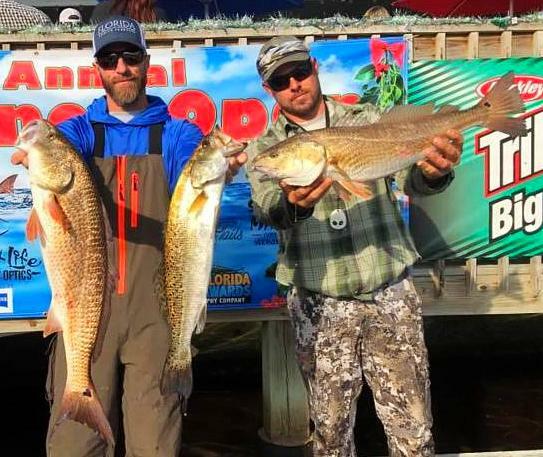 John Lannon and Matt Cowart won largest bag (two redfish, one trout) in the Eggnog Open. John Delgado from Lake City with an upper-slot redfish. And even at the very end of the month, after the cold set in, Chase Norwood and James DeChow came up with this fine pair. 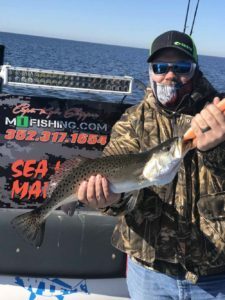 Jim Easterling from Georgia with a great pair of upper-slot fish, one red and one spotted seatrout. 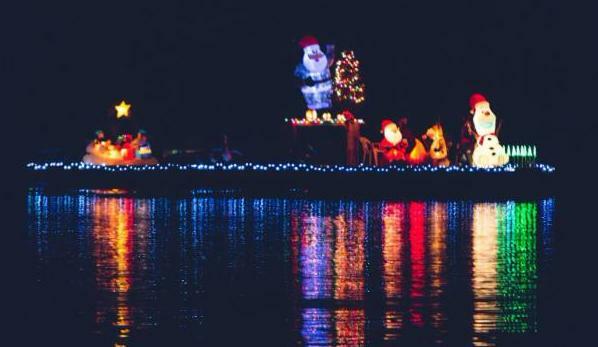 And finally — congratulations to Danielle and all the staff for putting together the winning entry in the Christmas Boat Parade!!! While we’ve avoided the really cold prolonged spells of weather, they will be coming this month. When that happens, keep in touch with us about trout coming into the river before you winterize your boat. 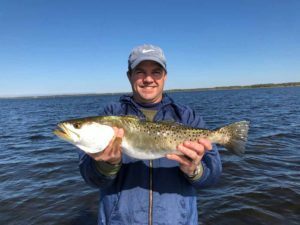 Fishing for trout in the Steinhatchee River is a great family activity, since the action is usually pretty consistent and there aren’t long casts involved; it’s great for smaller children. There are already fish in the river; we caught several sand trout and a few short specks while waiting for the tide to come in recently. However, with bitter cold fronts, the river gets large numbers of moderate sized keeper fish in schools moving back and forth into the river, and upriver as well. This time of year, the deeper the water, the warmer it is, so in general you’re looking for deep holes and most of them are rocky bottom. 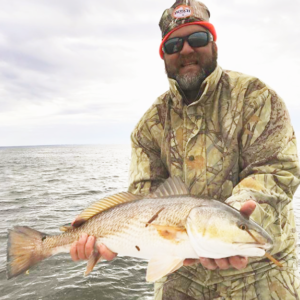 While you’ll see lots of fish on the finder, not all of them will be trout; mullet, croaker, sand perch, small black drum and even some redfish will move in as well. 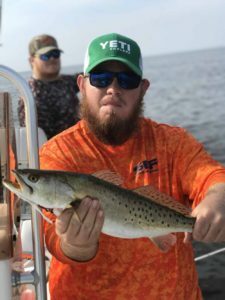 While most people fish from the curve at Gulf Breeze (where the resume speed marker is) to the mouth of the river, there can be fish way upriver, all the way to the “croaker hole” where the powerlines cross the river. The old time way of trolling jigs or 52M mirrolures is one way to locate fish; another is to go to where the boats are clustered and watch to see if anyone is catching fish. Drifting and fishing toward the bottom works as well; just make sure to stay out of the channel. When fish are clearly present, anchor as close as you can to the channel that will allow you to cast upriver and let your bait or lure sink as if comes past you. Then slowly jig it back to the boat. It needs to get down; fishing within five feet of the surface will get you very few bites. What to fish with? Just about anything that is relatively small. 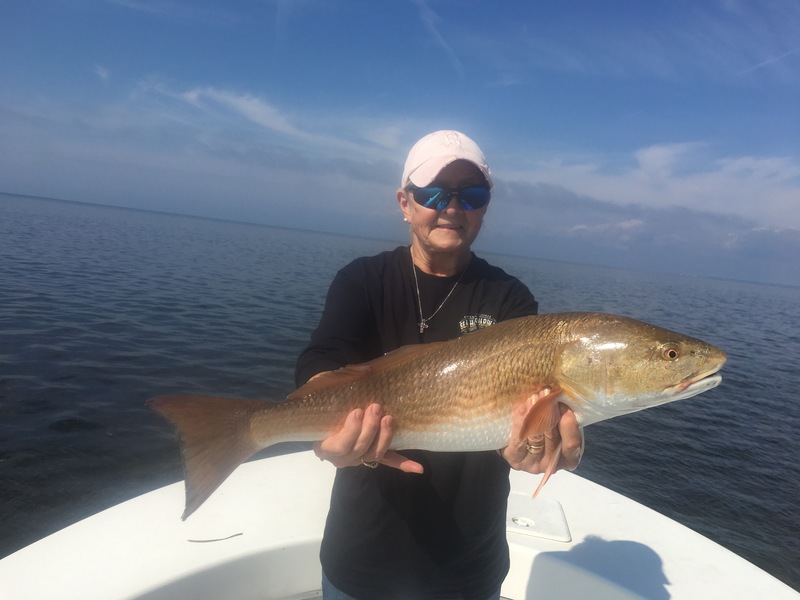 Classically, live shrimp with small sinkers or split-shot to get the bait down works very well. 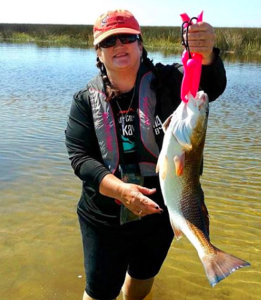 Most will use jigs with soft plastic tails, and anything with scent (like Gulp lures or Z-man tails) work fine, as do ½ oz. DOA shrimp. 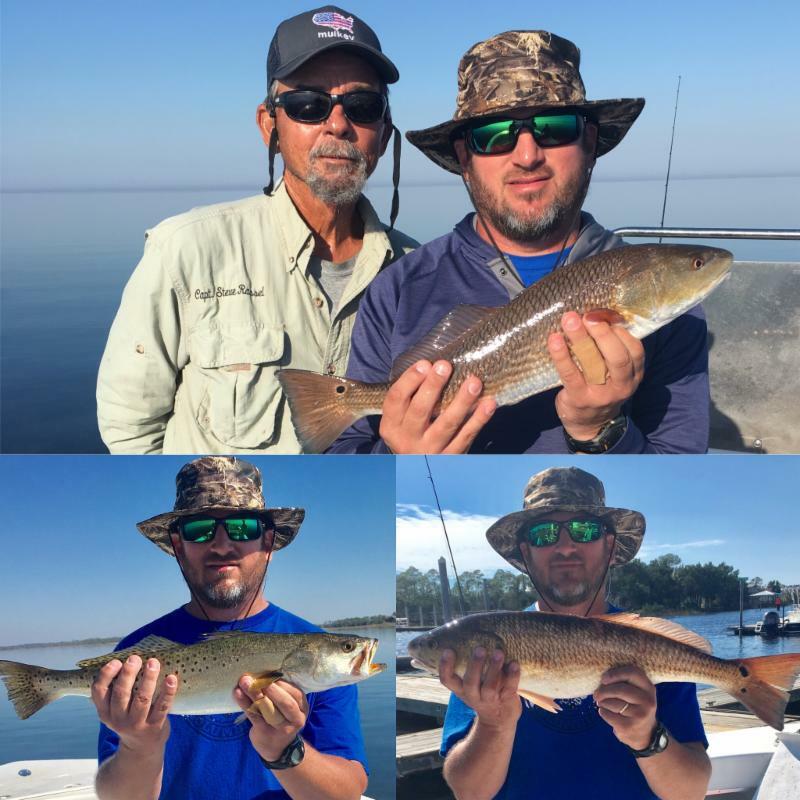 Sinking lures like the traditional 52M Mirrolures or even lipped suspending or sinking plugs like those from Unfair, Yo-Zuri or others. 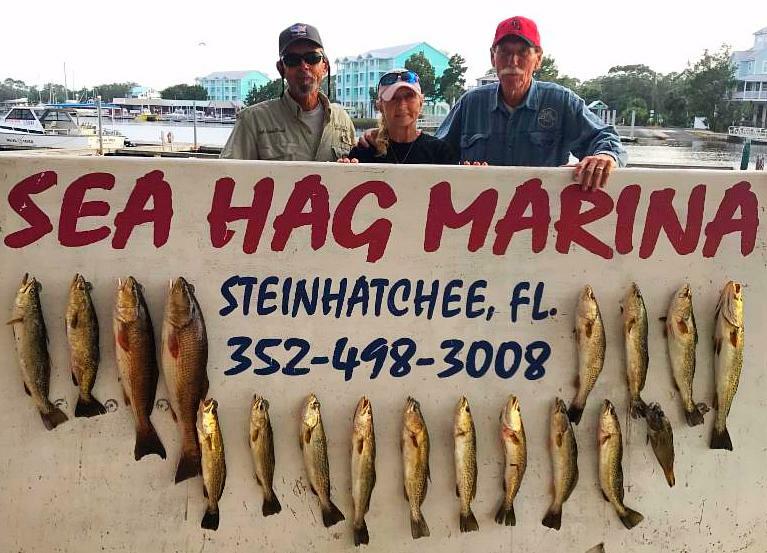 Our Ship’s Store will have all of these available, along with live shrimp and the tackle you need to fish the river. 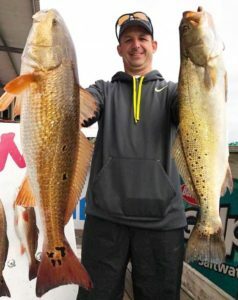 It’s likely that you may get hung on the rocky bottoms of the holes, so make sure you have enough jigs, tails and lures. 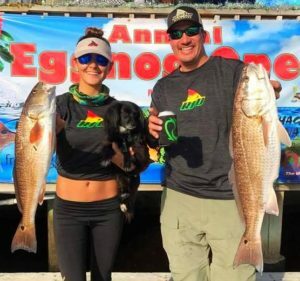 Remember: the closer to the bottom, the better the fishing. If the temperature warms up considerably in the afternoons, especially with higher tides, try fishing the shallower areas over mud. 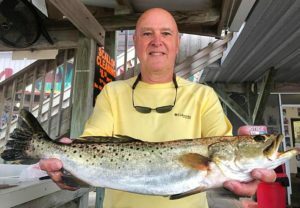 But one thing is for sure: when the trout come in the river, there are fish available to catch. 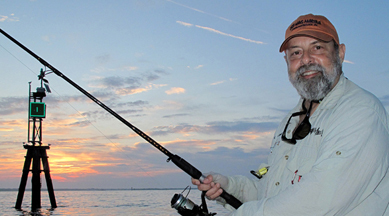 Be mindful of other boats and which direction they are casting when you are anchoring. A few years ago I switched to a trolling motor with “anchor lock” settings that will hold your boat in place without having to anchor; it’s ideal for fishing the river. 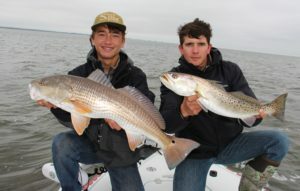 So dress warmly, take enough shrimp, tackle and lures, and come fishing. 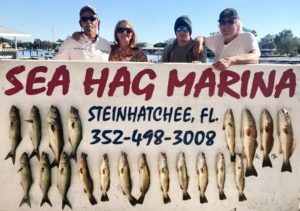 And from all of us at Sea Hag, have a great, prosperous and happy New Year. 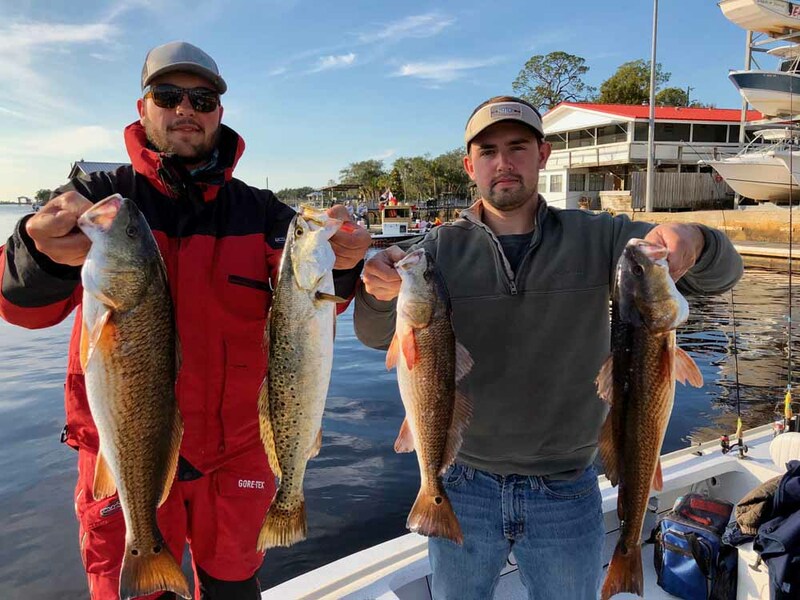 Large trout have been numerous on the flats and big redfish have been hammering the baits even in the cooler water temps. 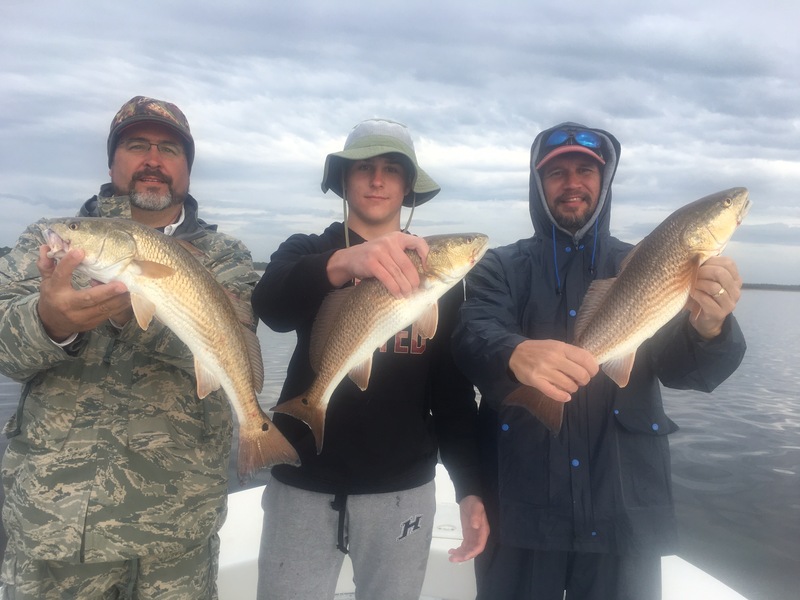 The temperatures have been generally mild making for a comfortable day of fishing. 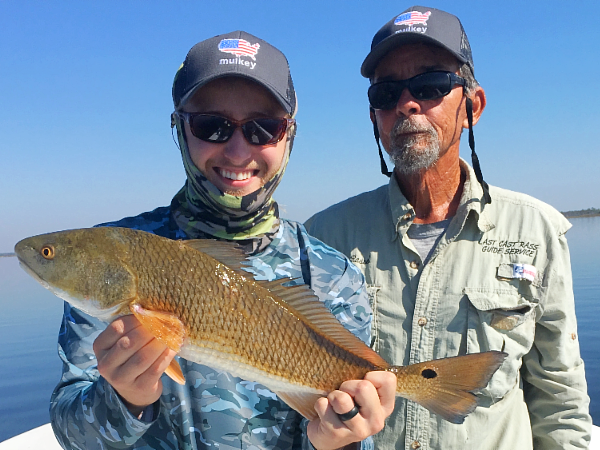 The boat traffic has been significantly lower out on the flats and the fish seem to be feeling less pressured. I still have plenty of openings in the near future and would be more than happy to show you just how the flats have been in person. I hope everyone had a wonderful holiday season.